A 3D reconstructed confocal image depicting cortical grey matter of a mouse after repetitive diffuse mild traumatic brain injury (rdTBI). Stefanie Robel, Oleksii Shandra, and colleagues induced mild traumatic brain injury in mice to mimic blows to the head that result in human concussions. A unique population of astrocytes responded to these injuries and the researchers observed spontaneous recurrent seizures in some mice within one month. 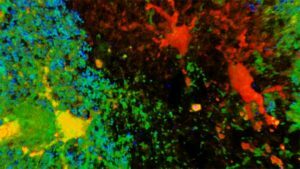 These results highlight the role of astrocytes in the development of epilepsy following the most common type of traumatic brain injury in humans. Virginia Tech is launching a $2.6 million study, funded by CURE, to determine if traumatic brain injuries can cause changes within the brain that lead to epilepsy. This multi-site study will examine patients with post-traumatic epilepsy and post-traumatic psychogenic non-epileptic seizures (PNES), and will compare these patients to those with traumatic brain injury (TBI) who do not have seizures using functional neuroimaging.